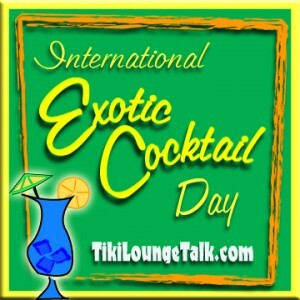 International Exotic Cocktail Day is just a Week Away! Mark your calenders! Get out your best Tiki mug! Friday, October 3rd will mark the third annual International Exotic Cocktail Day! What is International Exotic Cocktail Day? It’s a day to celebrate the pleasure of enjoying an Exotic Cocktail at your favorite Tiki Bar, on the lanai, by the pool, in your living room or on the front lawn. It’s a day to imbibe in your favorite mixes with friends and family. It’s a day to remember the people who started it all and the people who keep the traditions alive today! Started by Tiki Chris of Tiki Lounge Talk, International Exotic Cocktail Day is really just a great excuse to have a fun time with your friends, while enjoying one of the simple pleasures of life: Tiki Cocktails. The Official International Exotic Cocktail Tiki Group in Facebook has been growing and growing with hundreds of people, like you, who are ready to spend a few hours drinking great Tiki cocktails with their friends and families. Click here to join! You don’t have to go anywhere to enjoy this day. I mean, if you’ve got a cool Tiki bar near by, then go! If not, you can turn your own home into a Tiki Palace for the night. Click below for a list of Tiki Drink Recipes, and ideas on how to build your own Tiki Bar.